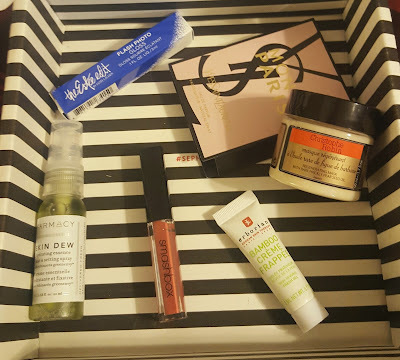 So I finally got off the Sephora Play wait list (and signed up immediately) and for $10 a month you get amazing stuff. I'm so much happier with the two boxes I've gotten then anything I ever got from the Ipsy Glam Bags and the best part is you can buy everything you like from the store and each moth you get 50 bonus points for making a purchase on an item that month. So here's my review of the October box and the moral of the story is get on that wait list. So I really like this as a setting spray but on raw skin I felt like it kind of burned but it did leave my face feeling fresh and dewy. However I prefer Tarte Rainforest of the SeaMarine Boosting Mist which is only $25 for a larger bottle. I will use all my sample but I'm unlikely to buy more. I loved this is is a musky scent that reminded me of my Grandma Connie. Unfortunately at that price point I am unlikely to buy it since my husband didn't really love the smell. But if you want to invest in a floral musky scent this one is lovely. BAD BAD BAD. This is not color safe. It did serious damage to my color. It doesn't say color safe but it is free of all the stuff that usually inn't and at $71 a jar I foolishly thought it would be ok. It didn't really feel like it made my hair all that softer after it was dried. I can not recommend this product to anyone with color treated hair. I think I am going to toss it. Or use it again when I am ready to dye my hair again. I use L'Oreal EverPure Sulfate Free Color Care Moisture Restorative Hair Masque for $13.50. I liked this a lot it felt cool on my skin. I used it in place of my daily serum when my skin was feeling raw and I didn't want the hyaluronic acid from my serum. I didn't think it was enough moisture to use on it's own so I'm not sure ho much use i'd get out of it in the winter but in the summer it would be great at night. This is only a step above aquaphor. I don't think it made my teeth look whiter and the consistence is weird. I'm disappointed Sephora put something with only 2 stars in the box but hey you can't get gold all the time. This one was great and I'm happy to own it. It was matte, long lasting and a great color. Very happy. L'Oreal Infallible Pro-Matte Gloss in Bare Attraction is a very similar cheaper alternative at $10.